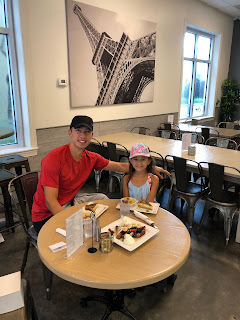 This past week on Saturday July 14th, we drove the four and a half hours to Charleston South Carolina for a week at Wild Dunes. It was a fun week with lots of family time and tennis. We all did the tennis clinics in the mornings Sunday through Thursday morning. This was our first time in SC in the summer and it was definitely hotter than we were used to. The tennis was hot, and in the afternoons it was too hot to do much besides swim and go to the beach. Unfortunately, the kids didn't really like swimming much, so the afternoons were kind of slow on some days and boring. In the evenings after I got done with work we watched a few movies on our Apple TV. 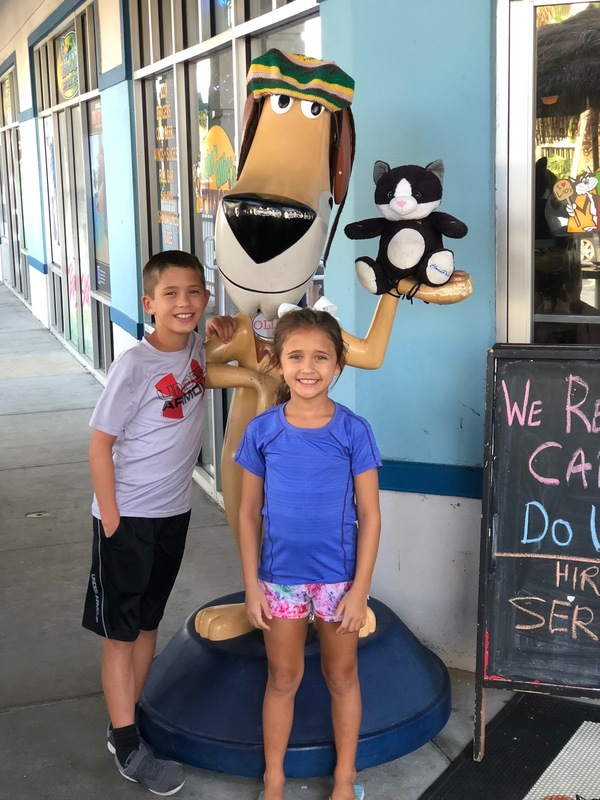 Paige and Connor recommended "The Greatest Showman" and we all loved it. At night before bed we'd play "Big Brother" where I pretend to be the kids' older brother and Connor's stuffed monkey Iggy is our little brother. We all get in bed together for bedtime and try to fall asleep while Iggy bothers everybody. Inevitably it turns in to a lot of tickling and goofing off and the kids would get riled up right before trying to fall asleep. For this visit, we rented a house this time in the Twin Oaks area (4 Twin Oaks) of the resort. It was on the south side of the tennis courts and was a great setup. The house was elevated, so we parked underneath it and the main floor was on up a flight of stairs. 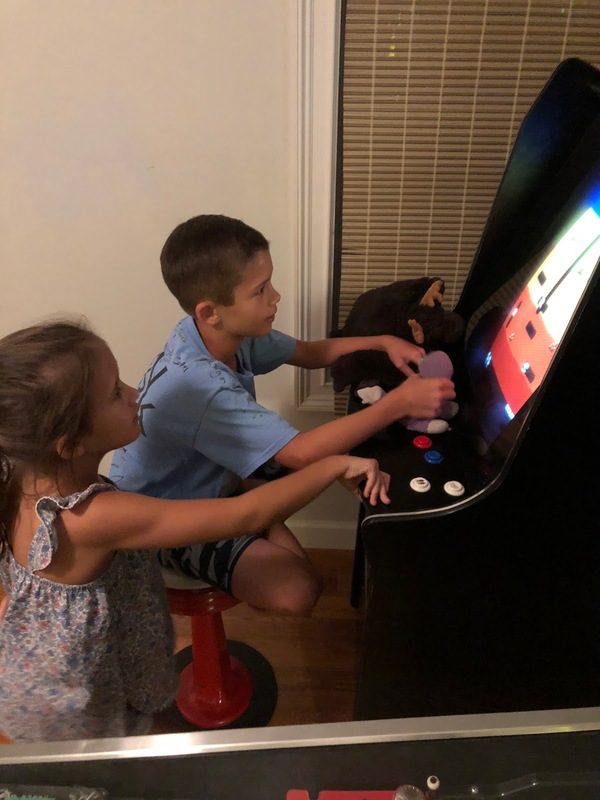 The house was one level and had three bedrooms as well as a finished bonus room that had a couch, pinball machine, jukebox, and an arcade machine. The pinball machine wasn't working, but after a maintenance guy came to change the batteries in the front door lock, he got it programmed for free play and found one pinball inside the machine. 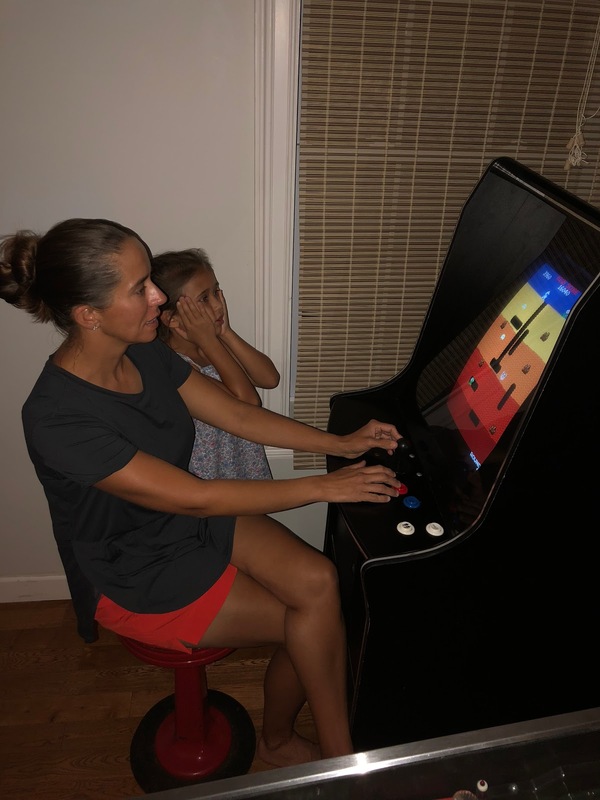 I was excited to play it, but after about 10 minutes I hit a bonus target and a little magnetic hand came out and grabbed the ball. After that the ball disappeared in to the machine and wouldn't come back out. I tried to find it, but eventually gave up. The kids didn't seem to care about the pinball game anyways and had more fun with the arcade machine. 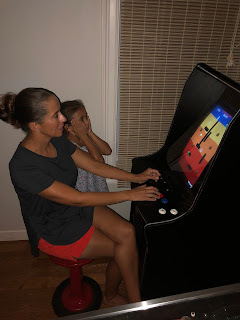 There were 48 classic games loaded, and the kids liked Pacman and Frogger, but our favorite game was Dig Dug. 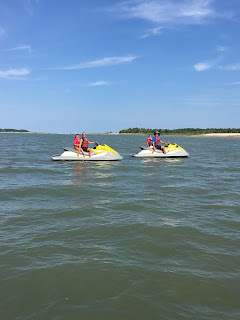 On Sunday we signed up for a jetski tour with a company that operated out of the Wild Dunes marina. Andrea rode with Paige and Connor rode with me. We had six other people in our tour group and unfortunately they were all a bit young, immature, and uncoordinated. There were four college girls that shared two jetskis and they were awful. Very early on they fell off and had to be helped back on, then they beached their jetski when they got too close to shore, then they fell off again a bit later. We spent far too much of our time waiting for the tour guide to help them. The other couple on the tour didn't do a good job following directions. We were directed to follow the tour guide in a straight line and the guy driving their jetski would cut through the line, spraying everyone with water as he passed. We actually had quite a bit of fun on the tour and enjoyed zipping around the waterways and together. What ended up spoiling the day for Andrea was at the end when we approached the no-wake zone. 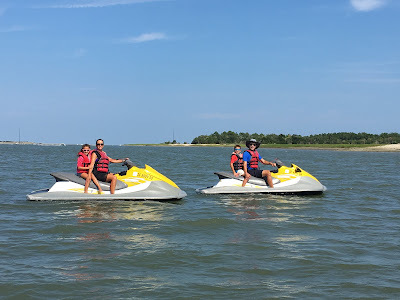 We were instructed to keep 100 feet between the jetskis and the awful college girls passed Andrea at high speed, dangerously close with maybe only 5 feet of clearance, drenching her and freaking her out with their reckless driving. The same girls ended up passing close to me as well and we were all very irritated with them for risking everyone's safety when they obviously couldn't control the jetskis very well. The tour operators were apologetic for the time wasted by the college girls and actually refunded us half of the cost due to the safety violations and issues we encountered. It was fun, but would have been a lot more fun with a different group. 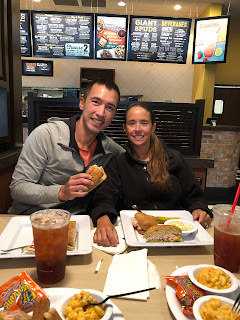 We enjoyed eating at Luke and Ollie's for pizza, Page's Okra Grill for some country cooking, and of course McAlister's deli for lunch most days. 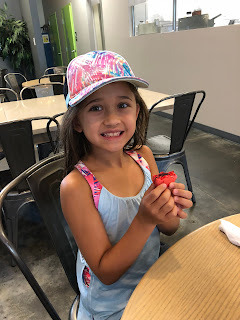 Paige loves French food and we have been wanting to go back to the Saveurs Du Monde Café ever since we went there a while back. We got up early on Wednesday for breakfast and ordered a bunch of goodies. We got Paige two raspberry macaroons, french toast, and quiche. We also got a few desserts to go. Paige and I really enjoyed our breakfast date out. Thursday morning we got one hour of tennis in before it started to rain. There was a lot of rain in the forecast the rest of the day and through Friday as well. We decided to leave on Thursday since there probably wouldn't be tennis on Friday and because it would be more comfortable on a rainy day back at home. The trip got cut short slightly, but it was fun while it lasted and we're looking forwards to going back when it's a bit cooler.